Innovate UK funded collaborative project aimed to develop an umbilical free robot (SIRCAUR), It is ROS enabled, uses ultra-wideband Pozyx positioning system for localisation, with a precision non-contact GPR sensor for detection of rebar and concrete corrosion and related defects. A NEW ADDITION TO OUR ROBOTIC CRAWLER RANGE!! We are pleased to announce the successful final demonstration of our SIRCAUR robot project. 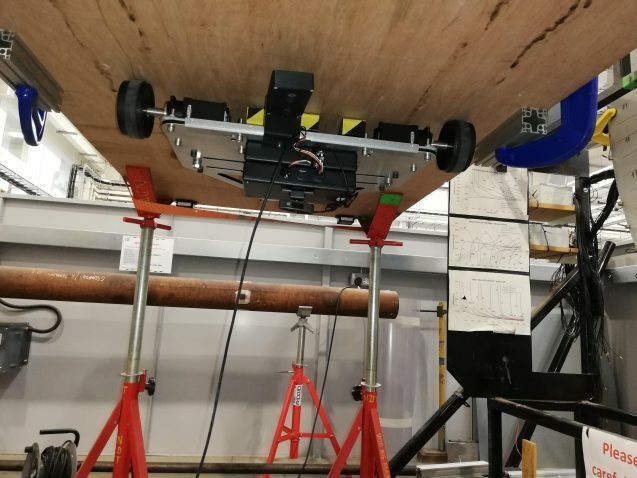 This Innovate UK funded collaborative project aimed to develop an umbilical free robot (SIRCAUR), It is ROS enabled, uses ultra-wideband Pozyx positioning system for localisation, with a precision non-contact GPR sensor for detection of rebar and concrete corrosion and related defects. A successful commercialisation of the SIRCAUR robot will lead to a large reduction in repair costs, can make a significant positive impact on the global economy. SIRCAUR is an Innovate UK project funded under grant number 103668.